The Janam XM66 has been discontinued. No direct replacement is available. The Janam XM66 features Summit's embedded Wi-Fi radio with unparalleled range, security, network performance and radio control. It also delivers Hi-Speed USB 2.0, a user accessible microSD card slot, more memory and increased battery capacity. The XM66 meets IP54 sealing requirements and withstands multiple 4'/1.2m drops to concrete across a wide temperature range. 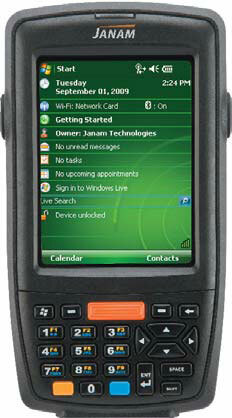 XM66, Wireless Mobile Computer (Windows Mobile 6.1, WLAN 802.11b/g, Bluetooth, 128/128MB, 1D and 2D Ready). Must order cradle kit or cables and power supply separately. See accessories. XM66, Wireless Mobile Computer (Windows Mobile 6.1, WLAN 802.11a/b/g, Bluetooth, Numeric, 128/128MB). Must order cradle kit or cables and power supply separately. See accessories. XM66 Wireless, Mobile Computer (Windows Mobile 6.1, WLAN 802.11b/g, Bluetooth, 128/128MB and Numeric Keypad). Must order cradle kit or cables and power supply separately. See accessories. XM66, Mobile Computer (Windows Mobile 6.1, Bluetooth, Numeric Keypad, 128 x 128MB, 1D and 2D Ready). Must order cradle kit or cables and power supply separately. See accessories.